Meeting your Sapa guide and driver upon your arrival to Lao Cai Station early in the morning, freshen up and Breakfast before transferring 55km to Muong Khuong. The road was recently upgraded to ensure smooth drive and enjoy beautiful scenery of the lush mountainous region along the way with some stops for nature wanders and photos. Arriving to the market place you will spend the whole morning joining the local tribal peoples of different groups coming from remote villages to attend the market for their most important week end activities. Shopping? Of course. You can see a variety of things for sales from farming products, medicinal herbs, spices to Chinese made electronic appliances... but is not as important as meeting, contacting, socializing and enjoying food! It is easy to realize the H'mong and Zao through their colorful dresses and head gears who are the massive at the market. 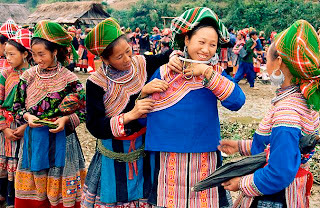 The Ha Nhi, Tu Zi, Tu Lao peoples in smaller numbers and wear unique traditional costumes which are not so colorful but beautiful. You will sit down for a simple Lunch while the market is getting over. The trip back to Lao Cai is more interesting for having lot chances for personal contacts with locals on the way back to their villages. 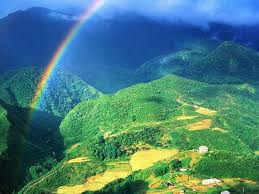 Then the road goes uphill to Sapa offers spectacular view of mountain and valleys to make the drive shorter. Arriving in Sapa in middle afternoon, check in hotel and enjoying a leisure walk around this charming town. 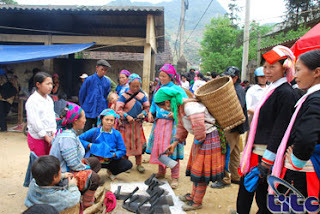 Starting from hotel with your guide, you will follow a trail running through fruit and orchard gardens, lush pine forests to a Black Hmong ethnic minority village named Matra, isolated away from the civilization. Chickens, water buffalos, pot - belly pigs and piggy everywhere, some locals will be happy to invite us to their home which offers chances to see their dwellings, weavings on belly looms to makes traditional costumes out of hemp fiber...Our path weaves itself up and down hills, through valleys with terraced rice fields which create spectacular landscapes. After picnic Lunch, we get to Ta Phin Commune where the Black H'mong and the Red Zao live together. It is very interesting to realize culture assimilation: Which can be mixed, which can not! At the end of the footpath, our car is waiting for us for the return journey to Lao Cai station for taking the overnight train back. Trip ends when arrives in Hanoi early next morning.